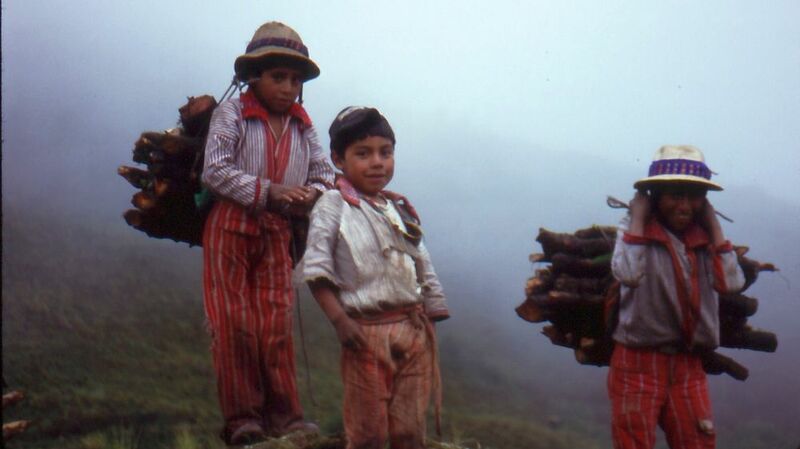 In 1992 I bought a one way ticket to Guatemala. 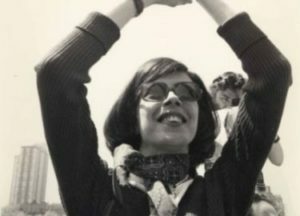 The goal: to learn Spanish, then return to New York to work with immigrants affected by brutal civil war and its aftermath. I spent my first month in the sleepy highland village of Todos Santos, and then I made a series of treks through Central America over the next eight months. Yet after each journey―El Salvador, Honduras, Mexico―I came back to dirt-poor, stunningly beautiful, unspoiled Todos Santos. 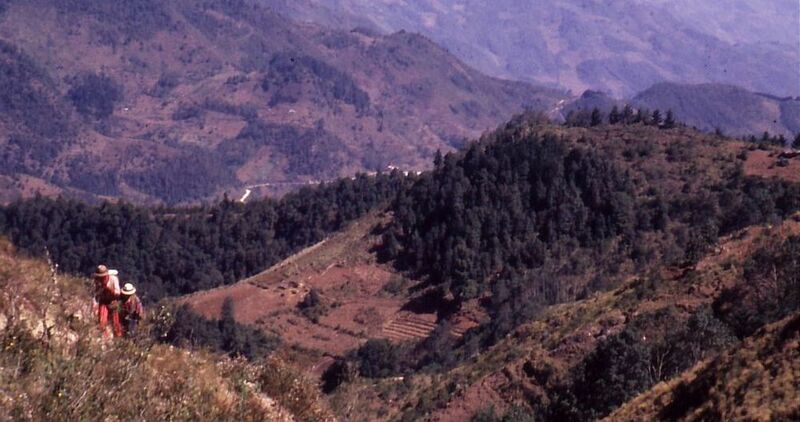 Saddled between the tall peaks of the Cuchumatanes, the town had two paved roads and three cars; flea-bitten dogs sunned themselves on the cobblestone streets. There were no phones, no banks, no televisions. Indoor plumbing was scarce. Hole in the wall tiendas―store fronts made artful by sun and rain―sold snacks, bread, soda, candles, and purified water in clear plastic bags. Quetzelteca, said to keep the indigenous drunk and thereby quiet, cost twenty cents per pint. 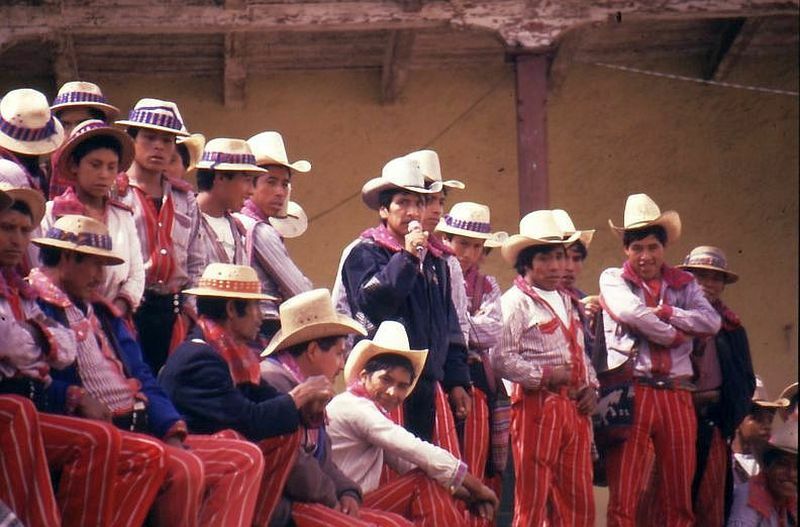 In Todos Santos, the proud indigenous men wear straw hats, hand-loomed red and white striped trousers and white shirts with large embroidered collars. The strong but obedient women wear the customary ankle-length dark skirt and colorful hand-woven vests. At the time, most lived in dirt-floored, sparsely furnished adobe huts heated by wood burning stoves. 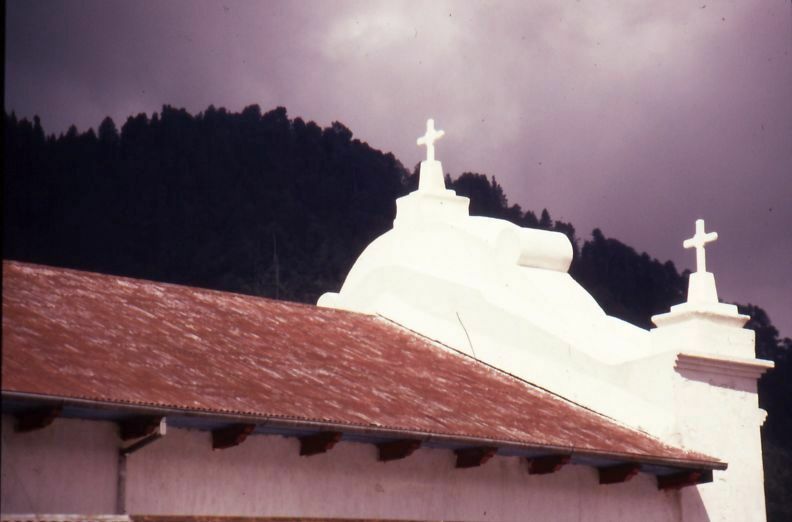 In the ’80s, during Guatemala’s Civil War, the village was massacred twice. The Army used the church as a prison, cut off peasants’ ears, set fire to feet, slaughtered mules, burnt crops, smashed tools, raped women. 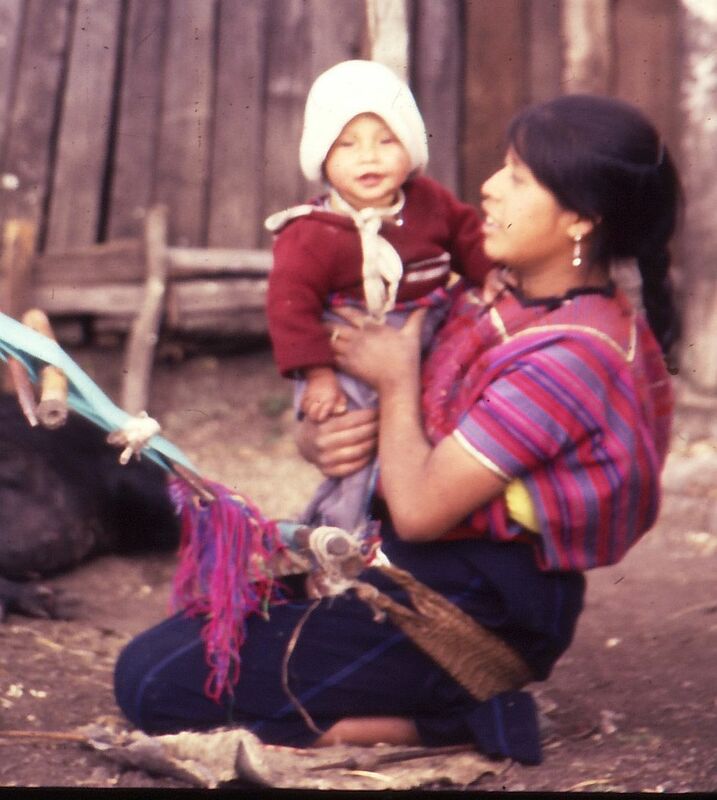 Such things occurred throughout Guatemala for quite some time. 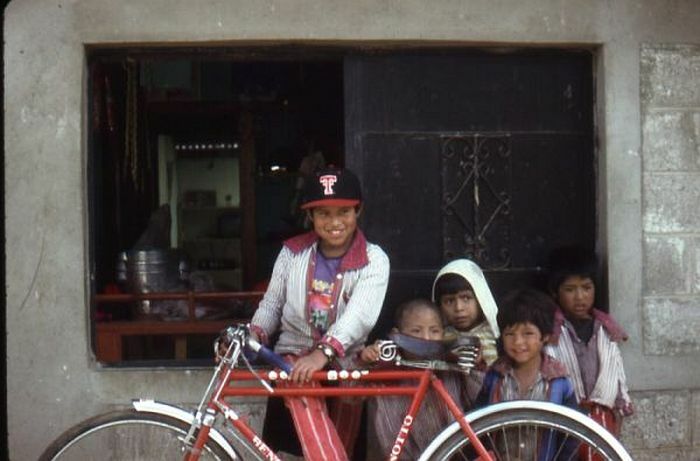 “Vida es triste,” say the peasants of Todos Santos. Life is sad. Most gringos haven’t a clue about the arduous farm work, the cold nights, the search for wood to light the stoves, the sun-beaten crosses in the quiet green field two hundred meters past the town market, a monument to the town’s tormented dead. I lived two trails above town in a half-constructed cement house being built by thin, industrious Desidero and his plump wife Clementina. On the first floor was a dusty jumble of tools, electrical wires, and broken concrete blocks, but the cast cement stairwell led to my perfectly square room with a box spring bed and a naked light bulb that hung precariously from the ceiling by exposed red wires. On the south wall, an arched window overlooked a valley of emerald cornfields and steep mountains dotted with scrub and pine. At dawn, as excited roosters crowed, as waking women re-lit ashen fires, a wispy white fog descended from the mountains into the valley. My rent was ten dollars a month. James, another gringo who occupied the room next door, slept in a Mexican hammock. Muscular and friendly, a frequent visitor who spoke impeccable Spanish, James earned the townspeople’s trust. Each morning, after a cold shower, after washing our clothes in the chipped cement sink by the chicken coop, after ringing out the wet cloth the Maya way, firmly twisting the water out inch by inch, hanging the laundry on a line atop the windswept roof, we walked the trail to Tres Olgitas, a dollar-a-night fire-trap of unheated rooms; the exquisite meals cooked by three young women always cheap and delicious. Sometimes without James, I hiked the long steep mountain paths. Trekked them for hours. What compelled these wanderings I did not know. “Where are you going?” asked the wheat-skinned villagers in their slow melodic Spanish. Their first language, M’am, so sharp and different with its frequent glottal stops. “For a walk,” I answered, beginning the long ascent. “For the exercise,” I say. Dumbfounded, they smile. Only fools work without compelling reason. 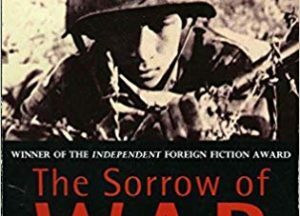 Another war―one with a prickly tangle of jungle and vines, its stifling green curtain of infinite heat, a war in Asia where sudden shots made dry red dirt more crimson that war, with its walking dead and ancestral spirits―dogged my every step. I did not know it. Once, when trucks from far-off cities and towns arrived with bales of used clothing, when distant villagers came to sell house wares, farms tools, meat from hanging carcasses, aromatic spices in wicker baskets or burlap sacks, an array of fresh vegetables, I wept before walking. It happened like this: Tugging on my jeans, buttoning my red cotton shirt, lacing up my leather boots; somewhere in town a man or boy struck a match to a string of firecrackers which announced Market Day. 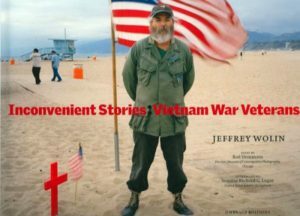 But this time I heard the crackle of AK-47s and M-16s, felt the heated downdraft from chopper blades, shook and sobbed until the flashback in a town twice massacred, in a country that had seen decades of devils, vanished. Like a good lieutenant, James does not get lost. When the sun fails to burn away the mists of impenetrable white, he marches forward, deftly twirling a hand-carved Kendo stick, as if chopping the clouds in half. Past the easy main trail, past the ladder-like gauntlet of switchbacks that force us to crawl or constrict or stretch our bodies, we climb to eleven thousand feet. On a grassy spot we slip off our packs, sit and gulp purified water. After a time, two peasant boys dressed in colorful rags drew near like jackals. I reach into my shirt pocket. “Here, I give this to you,” I say, in Spanish. A few cigar puffs later the boys cough and giggle and set the grass on fire. We help them extinguish the blaze, say to them “Adios,” then trek the last thousand meters to the home of Juan Pablo Lorenz. We’ve never asked Juan Pablo why he lives at the mountain top. Why he has chosen this lonely life. 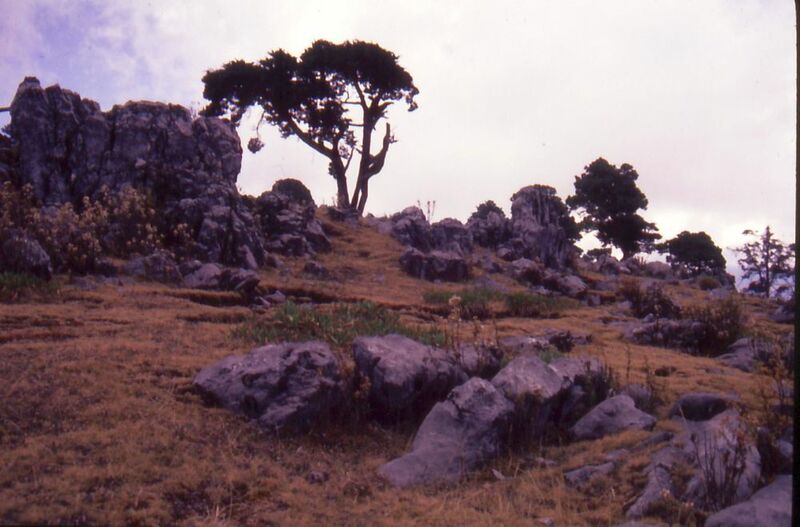 The Altiplano, unlike the fertile valley, is a landscape of desolate but spectacular outcroppings and skeletal trees, which stand out against the clear sky, the receding ranks of the pastel Cuchumatanes. Here, at twelve thousand feet, the thin air imparts a supernatural feel to all sight and sound. A crow’s wings claps like thunder. The bark of a dog is a frightful event. Few people visit here, but nearly all villagers have dogs to warn of thieves. Stepping forward, we crouch to enter the low doorway of the large hut built from timber planks stood on end. 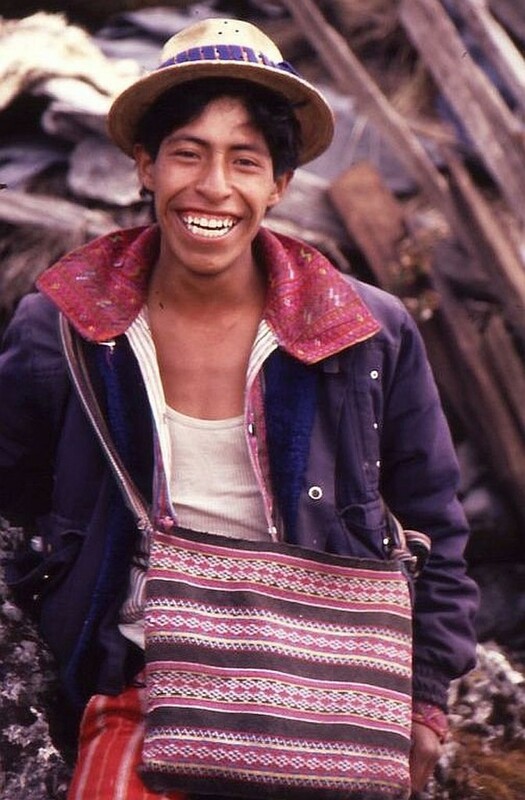 Juan Pablo, perhaps in his twenties, is a thin, happy man with a broad handsome face; a half moon smile reveals his large white teeth; his thick black hair pokes out from a traditional straw woven hat. His pretty young wife, Elizabeta, carries their frightened infant daughter on her back in vibrant cloth stitched with ancient Maya patterns. “Mmm… mmm…” she hums to her child. But still it whimpers. In the center of the dirt floor, James, Juan Pablo and I sit around a three stone fire place. Behind us, in the dim light that peeks through the cracks between the upright boards, a kitten prowls through shards of broken pottery, dried chicken bones, wood shavings, newspapers, cardboard boxes. Here, an hour’s walk from town, nothing is thrown out. Juan Pablo leans forward, turns his head sideways, and gently blows on the embers until the wood crackles and bursts into flame. The wood planks reflect our shivering shadows. The rising smoke exits through a small blackened hole in the roof. The fire slowly draws the chill from us. I offer gifts: bread, hard-baked cooking chocolate purchased in Antigua, a pound of unshelled peanuts, four tins of milk, a large felt blanket. I don’t know why I climb so hard each day or if I need to help this man survive. Elizabeta begins the ritual of making tortillas. She has already ground the corn in the traditional manner, whetted it into a thick white paste. In the warm hut, as her body shifts to the patter of her moistened palms, which quietly slap and press the dough into patties, the anxious child is lulled to sleep. One by one Elizabeta sets the bread disks onto a circular pan she has placed over the fire. One by one she turns the tortillas over with her finger tips. In these moments of tapping palms, the padded step of the playful cat, the burning wood sliding into itself, in this land of Maya dressed in brilliant patterns, of clandestine graves and unbridled beauty, James is puzzled by my tears but does not ask why I cry. And if he did I would not be able to tell him. We say “Adios” to Juan Pablo. 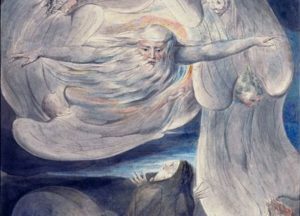 Goodbye to his wife, to the sleeping child, the slumbering kitten, the vigilant dog. The return trek goes well. Like the Maya on steep trails, we tilt our bodies back, taking short hurried steps as we trot downhill. On the main wide trail, we run in curves which absorb our momentum so we do not to trip or fall or tumble over the mountain. 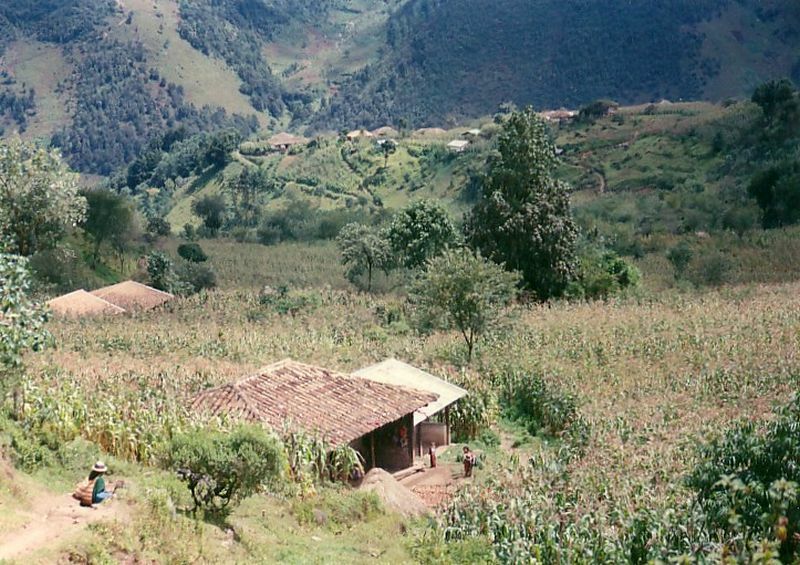 We arrive at the village in half the time it took to reach the home of Juan Pablo Lorenz. I say goodbye to James. “See you tomorrow,” he says. Then he is off for a communal meal at Tres Olgitas. 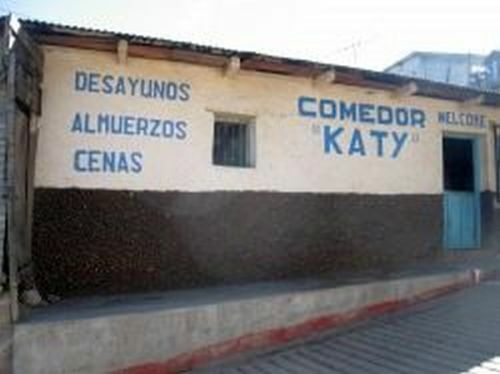 There are no customers yet at Comedor Katy’s, a restaurant of two cement rooms furnished with simple pine tables and chairs; there are no menus, there is no music. An indigenous girl takes my order. It is always the same: a large bowl of vegetable soup, a plate of rice and chicken. “Si,” I say. “Y pollo.” The girl leaves. In the dirt yard out back there is the sound of flapping wings, scampering feet, desperate squawks and final cackles. A cut to the neck and the bird is dead. Waiting for the meal to cook, I see a small boy peering through the half open door; I wave to him. 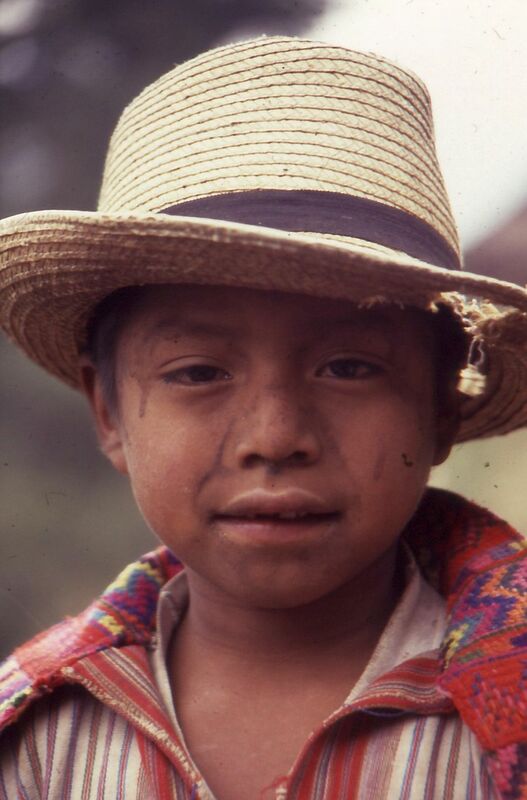 Barefoot, he wears torn dirty clothes, a hat with a hole in it, his face a mixture of hope and fear. He stares at me. 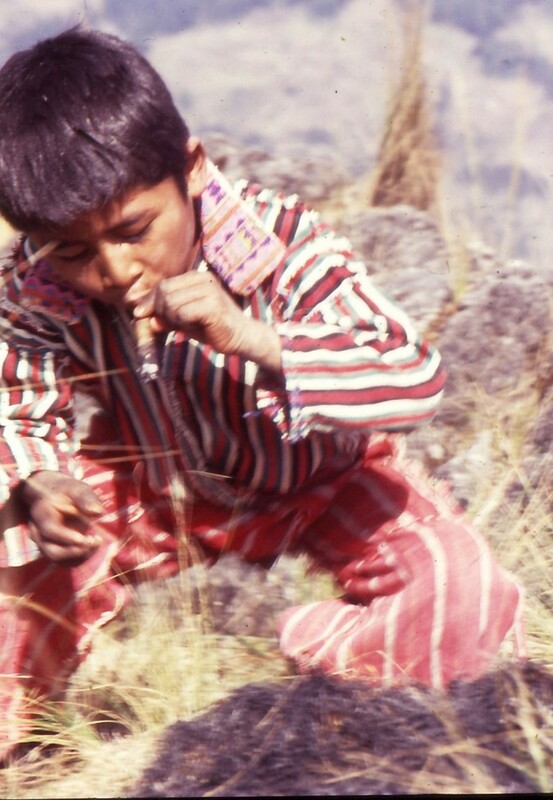 I know this child; he has often approached then run away whenever I’ve climbed or descended the mountain alone. I make a welcoming gesture. The boy hesitates, then runs in and sits in the chair opposite me. “What would you like?” I ask. “Naranja,” he says, pointing to an empty bottle on a nearby table. I call to a young woman in the kitchen lording over large kettles atop a wood burning stove. She steps out from behind a curtain, her face and hands moist and pink. “Uno, por mi amigo,” I say, pointing. The girl nods; disappears, moment later sets a new bottle on the table. The boy, perhaps eight years old, cannot contain his excitement. I pry the metal cap off with the tip of a knife. He grasps the bottle with both hands, lifts it to his mouth, and guzzles the thick orange drink. Nothing I can do will change his plight but for now he is happy. Tacked to the far wall is a colorful poster of a gringo Jesus, his arms held wide open, palms turned upward, as if to embrace the world. 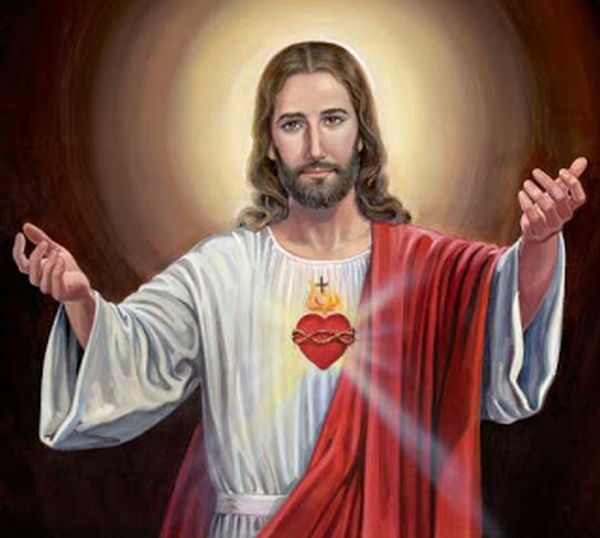 His parted shirt reveals a split open chest; bolts of yellow light streak from his red sacred heart. As the boy drinks the sugar water, as King Jesus holds his sacred smile, as the soft clink of silverware is not the biting song of bullets, the girl sets the bowl of simmering vegetables, the plate of meat and rice, on the table. The aromatic steam fills the room. The boy stares at the feast but is silent. There is much hunger in proud Todos Santos. “Pollo, por mi amigo,” I say to the girl. Suddenly a middle-aged woman steps out from behind the curtain, with all her might hurls her sandal at a skeletal dog, drawn by the scent of food. She yells at the gaunt creature. A hundred glottal curses fill the air. My legs and body tremble. The boy looks at me strange. What’s happening, little friend? No, it’s not the cold mountain air or shivery chills but the sight of the thrown sandal and the sound of your last words that whisk me back in time. 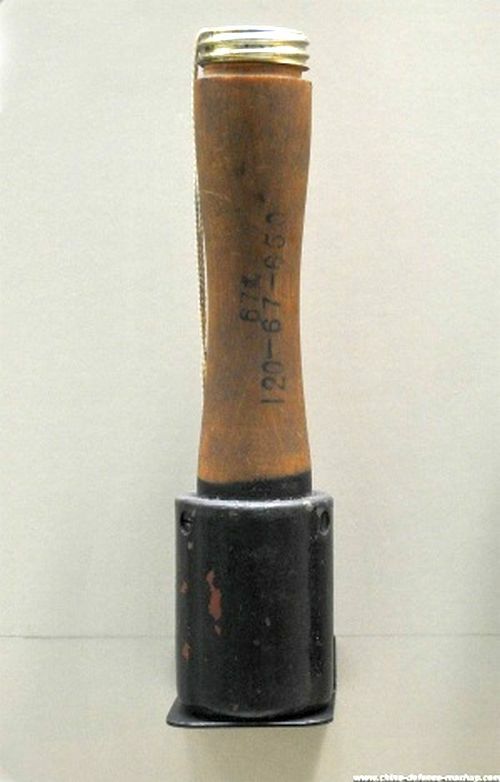 Enemy grenades, primitive but effective, more often maimed Americans than killed them. During the ambush, after the snap of the chemical fuse, caused by pulling a bit of string, the invisible enemy hurled the wood handled grenade at us. 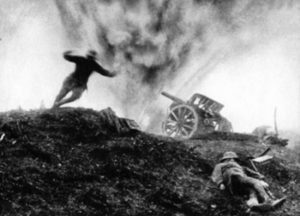 It fell short but the blast twisted the machine gun’s barrel as if it were clay. Someone threw one of ours, a smooth nasty little bomb with a killing range of five meters. After the fiery blast a sergeant thought we’d killed them all. But then a second snap, and this time the grenade landed between us and we five soldiers scampered away but not soon enough. BOOM! And we lay screaming. But what can I say to you, my friend, that your family or neighbors do not know? What could I say, and how could I say it and what difference would it make in your world? The dog yelps and scampers away. The angry woman picks up her shoe. The boy upends the bottle and drains it dry. “Gracias, amigo,” he says, smacking his orange stained lips. “Gracias.” Then he is gone. 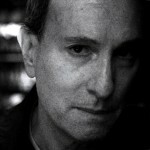 That night―after walking the small trails to Desidero’s house, trudging up the cement stair case, after turning off the naked light bulb and laying down in my box spring bed in my square room overlooking the fertile valley, cloaked by darkness, sheltered beneath a felt blanket, before sleep overtook me―my tears fell like rain.